Liquid level sensors, also known as hydrostatic level sensors, measure level by converting the pressure of a liquid based on its height above the sensor and its density into a linear output signal. Liquid level sensors are a cost-effective solution for monitoring various types of liquids including those that require Intrinsically Safe approvals. Submersible, Vented Tank: The most common installation method is fully submerging and lowering a submersible designed sensor, like the CS12 model family,to the bottom of the tank. It is important to ensure that the sensor is at the very bottom of the tank to provide the most accurate level readings. Submersible sensors are used in vented tanks and the sensor itself features a vent tube that runs the length of the cable and terminates with the rest of the conductors. Core Sensors offers ETFE as a standard cable jacket material to ensure compatibility in a wide range of medias. Sensors come standard with a 1/2″ MNPT conduit fitting for customers that want to install conduit piping over the cable. This method of installation is common in applications where the media may not be compatible with the cable jacket material or in mobile tanks. The conduit fitting will help keep the sensor stationary during tank movement. Core Sensors offers customizable submersible pressure transducers for both industrial and Intrinsically Safe applications. Externally Mounted, Vented Tank: Standard pressure transducers can be externally threaded into the side of the tank when using a submersible sensor is not ideal. Externally mounted sensors typically cost less than submersible sensors and there are less materials that need to be considered in terms of compatibility. These sensors are vented to atmospheric pressure by a vent tube or vent hole. Externally mounted sensors can be configured with integral cable as well as various connector options including an M12x1 Eurofast for an IP67 rating. Customers can also choose to install a submersible designed sensor externally with a ¼” NPT Male process connection instead of the standard nose cap. This installation method is ideal for environments where flooding is a concern such as ship compartments. Differential pressure transducers can also be used to measure liquid level in a vented tank. The high side of the sensor, also referred to as P1, is threaded into the bottom of the tank while the low side, also referred to as P2, is left open to atmospheric pressure. The CS14 Differential pressure transducer would be recommended for this installation method. Externally Mounted, Sealed Tank: When measuring liquid level in a tank that is completely sealed, it is important to use a differential pressure transducer to ensure accurate level measurements. The high side of the sensor, also referred to as P1, is threaded into the bottom of the tank while the low side, also referred to as P2, is threaded into the top of the tank. The sensor then measures the difference in pressure from the top to the bottom of the tank and transmits a linear output signal. 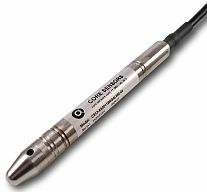 For applications where installation space is a concern, Core Sensors offers the CS13 Slim Submersible Pressure Transducer. With a max diameter of 16mm, the CS13 is a great choice for submersible level measurement within a borehole, water main pipe, or other confined space.